Connor Court Cover high-performance, portable floor cover system incorporates easy alignment, quick assembly and reduced storage requirements. Unique features include recycled non-marking thermoplastic backing, highly stain resistant surface and excellent sound absorption. Transform your gymnasium into a high-end meeting space and make use of your largest assembly area without worrying about damaging your investment in the hardwood court. Most hardwood floors are multi-purpose. So your floor has to hold up to a lot more than sports – dances, concerts, graduations, and other activities. It gets heavy foot traffic, stains, scuffs, impact from furniture and more. CourtCover Light is built tough to protect your investment and add years to the life of your floor. PortaFloor Pro® is the ideal solution for creating protective, portable flooring over your indoor or outdoor performance surfaces. It is roll-able, easy to install and remove, and versatile, allowing you to cover artificial turf, dirt, ice, asphalt, concrete and many other surfaces. Available in UV-resistant granite as well as custom colors on request. Gymnasiums, sport venues, basketball arenas, rodeo arenas, ice hockey arenas, and outdoor football and soccer fields. 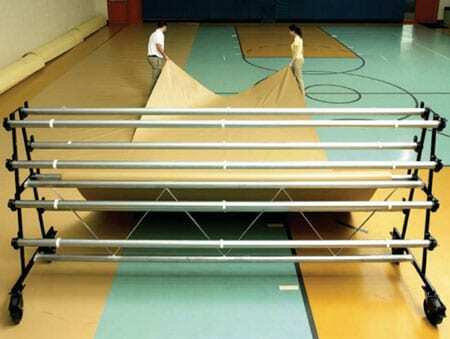 Z floor provides gym floor covers throughout Texas and Oklahoma.